Over the last seven parts of this series we’ve looked at a variety of alternative means of propelling cars. It’s been an interesting technological journey, but in a way, the technology is not the most germane aspect in predicting the likely outcome - or even for that matter, the best outcome. After all, the technology (electric cars) already exists for people to undertake most of their journeys in machines that are quieter, have lower total emissions and have better performance than conventional cars. The technology already exists for people to undertake many of their journeys in vehicles that have zero emissions and would improve public health (human-powered vehicles). In fact, social and economic factors are more important to the outcomes than technological factors. But before we look at these factors that are so seldom discussed, let’s turn our attention briefly back to technology. As described earlier in the series, solar-powered cars are never going to be effective at a mass production, consumer level. This is simply because the energy provided by the sun is too diffuse to allow sufficient to be gathered in just the plan area of a car. Turbines, while very effective in aeronautical and continuous high power use, are ill-suited to automotive application. This is primarily because their efficiency dramatically declines when used at less than full power. To be effective, a turbine would need to be sized so that it could operate continuously at full power, perhaps driving an alternator charging a battery. 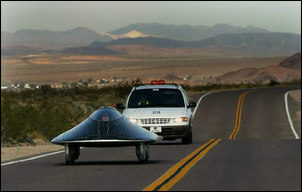 However, matching of the turbine output and the required power to drive the car is still needed. Despite the major commitment of car manufacturers to fuel cell vehicles, their current inability to run on the two most widely spread (all-pervasive, it could be said) energy sources in the world – the liquid motor fuels of petrol and diesel, and electricity – is a massive disincentive for consumer purchase. 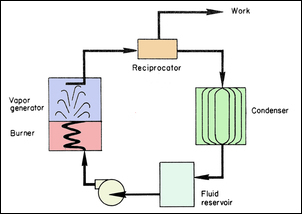 And while direct hydrogen remains the dominant fuel cell input, that disincentive will apply almost irrespective of the technological developments of the cells themselves. We live in a society where, as one grows up, there is a transition in personal transport. Other than walking, the first independent, personal transport that most children have available to them is the bicycle. I for one remember the enormous freedom that a bike gave me: it immediately extended my geographical and philosophical horizons in a way that remains to this day a sweet memory. In much the same way, my first car opened my horizons another distinct step. Such a tale is not unusual; in fact, it’s the norm for western societies. However, this transition – walking, perhaps public transport, then bike then car – implies to many a hierarchical progression. A car is seen as better than a bike – so going back to human-powered vehicles is a retrograde step. Riding a bike suggests the owner cannot afford a car – otherwise, why would they be bothering to ride a bike? Therefore, the first requirement for the adoption of human-powered vehicles is the societal recognition that pedalling is not automatically subservient in socio-economic status to cars. A recumbent, faired bicycle is the most efficient form of transport ever devised. It has the lowest CO2 emissions, lowest ‘fuel’ consumption, and given a reasonable life, is very likely to have extremely low per-kilometre production energy and emissions costs. 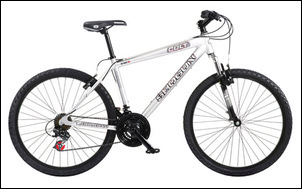 The memory many have of childhood bicycles is sitting on a narrow seat (which in the case of men is often the cause of testicular discomfort and may well be associated with testicular cancer) and labouring at the pedals to develop a continuous, high power. However, such a view is similar to an elderly person remembering the discomfort and instability of a 1950’s VW Beetle in a cross-wind and believing that current cars drive the same way. 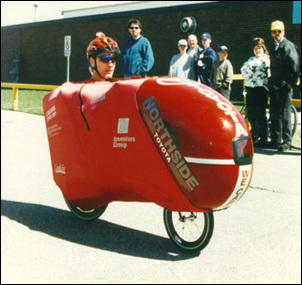 Pedal-powered machines have dramatically changed. The evolution of the car in our society has been premised on the basis of one car for all uses. For example, a family that tows a caravan on holiday three or four times a year has a vehicle sized for that task. Someone who annually ventures off-road a similar number of times owns an off-road capable four-wheel drive. In both cases, perhaps 80 per cent of the annual kilometres driven do not require such a vehicle; in fact, for this majority time, the car is ill-suited to the use. Clearly, having available multiple cars that suit various applications is much more efficient in terms of fuel consumption, emissions, ride comfort, size, and so on. However, the current system of insurance and government registration penalises such a multi-car approach. A family might have three cars, but only one is ever on the road at a time. However, the registration and insurance costs are three times as great as having the one car. This is illogical. Secondly, the fact that people largely purchase outright (or lease) cars for their sole use vastly reduces the fluidity that could apply. Most people do not modify or personalise their transport (clearly, lots of this magazine’s readers do, but most car owners don’t!) and so there’s no need to have exclusive, 24/7 rights to a specific vehicle’s use. Instead, in any community, it would make far more sense to have a pool of vehicles that can be drawn upon. People might well own only the car that suits the majority of their use and then hire a ‘pool’ car for specialised applications. (In the same way, having in a single Australian suburban street five 6x4 trailers, each of which is used perhaps 20 hours a year, is complete madness in the use of resources.) Pool cars could include 7-seat diesels, electric cars, hybrid cars, sports cars (ah, you’re paying attention again! 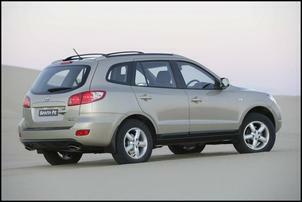 ), off-road style four wheel drives and so on. Drive to work every day in an electric car and then have a sports car for the weekend. Or a car that could tow your boat. Or... Pick-up and delivery to the pool location would be free and bookable. Such a system would vastly reduce overall fleet emissions and fuel consumption. Arguably, it would also improve road safety (people would have better access to a vehicle suitable for the task they’re undertaking) and could reduce individual car ownership costs. The latter’s especially the case if a broad community perspective was taken, where the societal advantages could attract cost-effective government subsidy. (Public transport is almost always subsidised by the government on the premise that it is more efficient – so why not subsidise such a car pool system?) People would also experience a much broader range of cars and so be far better informed as to what cars exist and what tasks they are most suitable at performing. A pool approach would also move away from the design paradigm that cars need to be able to do most things well. For example, the production of a city-only car would then make sense – there would be a market for a car with excellent 0-100 km/h acceleration (but it doesn’t go any faster), 100 kilometre range, small interior, and so on. Some people’s weekly commuting fuel costs would drop by 80 or 90 per cent with no downsides. While the technology of the car has changed massively over the last 100 years, and that technology has been developed by car companies and their suppliers, in many cases it has been the pressure of government that has seen clear societal benefit. The introduction of fuel injection to mainstream cars came about because of US emissions legislation, (and ditto EGR, cat converters, etc); crash safety improvements have been driven by government legislation and independent crash testing; fuel consumption improvements have come from US CAFÉ legislation (and, indirectly from emissions legislation). Of course, there are many exceptions to this – electronic stability control and ABS are two technologies developed without government pressure or legislation. However, with the current scientific awareness of global warming, the time is now ripe for governments to impose on car companies requirements that no doubt the companies would find draconian. Requirements, especially, in the areas of fuel economy and CO2 emissions now need the same radical revision that last occurred some 30 years ago. Such an approach would immediately create far more efficient cars and would expedite the introduction of some of the technologies covered in this series. The technological focus of this series, and of most discussion of alternative powerplants for cars, ignores the point that the technology already exists that could dramatically reduce fuel consumption, reduce emissions, in some cases improve performance, and improve public health. The broader social issues of the hierarchy of transport technologies, ignorance of advanced pedal-powered machines, government and societal structures that promote ownership and use of just a single all-purpose car, and reluctance of government to enact legislation compelling a rapid move towards more efficient machines – these are the impediments to dramatic change.